Our wineries offer a huge variety of experiences, enabling visitors to combine their interest in wine with the pursuit of other passions. 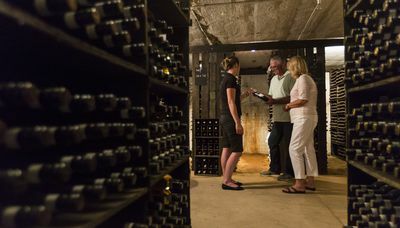 For the talented home cook or enthusiastic foodie, a selection of our wineries specialise in experiences to enhance your culinary knowledge or skill set. In the famous Barossa Valley wine region, just over an hour from Adelaide, Jacob’s Creek Visitor Centre is the home of the internationally renowned Jacob’s Creek wine brand. 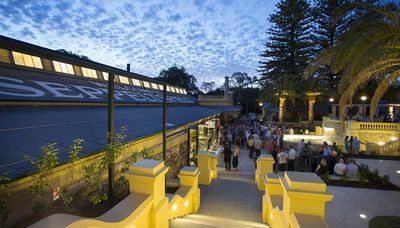 The Jacob’s Creek Visitors Centre has been recognised as a leading wine tourism site in Australia and was entered into the South Australian Tourism Hall of Fame in 2010 for winning Best Major Tourist Attraction three years in a row. The centre offers a memorable culinary tourism experience with a tempting combination of food and wine, with sweeping views of vineyards and hills. At a Jacob’s Creek Cooking Class, led by the talented Jacob’s Creek Chefs, you will be guided through the process of selecting the produce from the impressive Kitchen Garden and the preparation of a gourmet meal either outside or in the kitchen overlooking the historic Jacob’s Estate. At Pizzini Wines in Victoria’s scenic King Valley, the A tavola! Cooking School, run by Katrina Pizzini, offers a range of relaxing and inspiring cooking classes throughout the year. There is something for everybody with classes such as “Pasta Gnocchi & Risotto” and “Salting, Smoking & Curing Meat” Click here to see full descriptions of the various standard and speciality classes on offer throughout the year and to book your place. On the Pizzini Wines Fine Dining and Hands On Learning experience, you can combine a cooking class with a tasting, lunch, dinner and overnight accommodation. 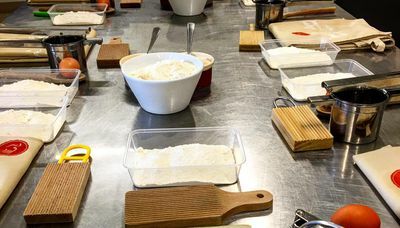 Your experience will start with an Italian cooking class with Katrina, the class is hands-on with each participant helping prepare the dishes to be shared Italian-style for lunch. Next you will enjoy a private tasting at the cellar door to select a wine to accompany your meal. The remainder of the afternoon is yours to explore the local scenery and check into your accommodation at the Pizzini owned Mountain View Hotel where you will indulge in a four course dinner in the Dining Lounge matched with wines made by Joel Pizzini. Visit Montalto on Victoria's stunning Mornington Peninsula and you get much more than wine - the estate is also renowned for its welcoming ambience, relaxed Australian architecture, intimate cellar door, and the beauty of its grounds. Start your experience with a tour of Montalto, your guide will lead you through the working vineyard and olive grove, kitchen gardens, fruit orchard and berry plantation; explaining Montalto’s Estate to Plate philosophy - growing as much produce as possible for the acclaimed Restaurant and Piazza Café on site, and sourcing everything else locally and responsibly. Depending on when you visit, you might perhaps taste the grapes around vintage, learn how the kitchen team grow and make use of the seasonal produce or explore the property’s natural wetlands and extensive permanent sculpture collection. Included is a private and structured wine tasting in the Wine Experience room overlooking the property, featuring Single Vineyard Wines that truly reflect the location of the vines. Complete your culinary experience with a stunning three course lunch in the restaurant, with matching wine.